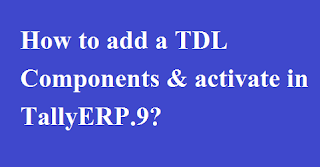 Home / TallyERP.9 Lessons / TDL Extensions / How to add a TDL Components & activate in TallyERP.9? 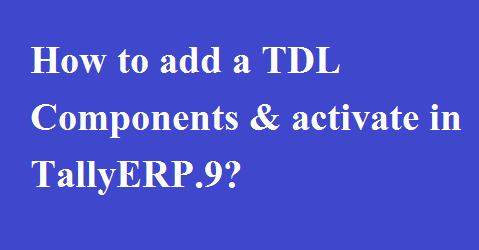 How to add a TDL Components & activate in TallyERP.9? TDL means Tally Definition Language, which is used for adding an additional feature to your Tally software to make your work easy. TDL allows us to define tasks in Standard English Statements. This simplifies the process of definition, allowing even a person without any programming language background to work on TDL. TDS statements required to perform a particular task, can be created in a file using IDE provided by Tally.ERP9, such as Tally Developer. Such a file is called TDL File. Save the file with extension "txt" or ".tdl"
The file can be compiled into a file with an extension.tcp (Tally compliant product). It is possible to compile the file for a particular Tally Serial Number. The path of the TDL program has to be included in the Tally.ini file, using a parameter called ‘TDL’. If the parameter ‘User TDL’ is set to NO, Tally.ERP 9 will not read any TDL parameters specified in the Tally.ini file. When Tally.ERP 9 starts, it looks for a file named ‘MyReport.tcp’ or ‘MyReport.txt’ in the directory C:\Tally.ERP 9. On loading the default TDL files into memory, Tally.ERP 9 reads and loads every TDL file mentioned in Tally.ini into memory before displaying the first Menu, ‘Gateway of Tally’.